This is what supermarkets in Egypt are for. 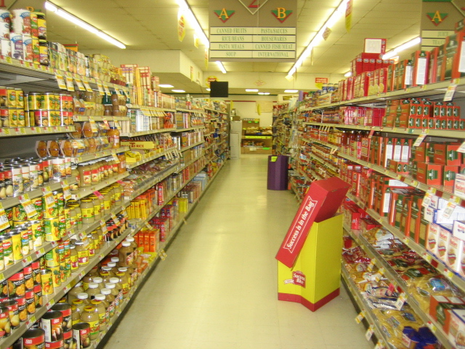 A relatively new phenomena, there are many different supermarket chains, not unusual for a city of 20 million people, and for the most part they are not much different from ones in America except generally they’re not Wal-mart size and might be a little bit more crowded and/or have peculiar scents. Out of all the ones I’ve visited here so far, Alpha market is by far my favorite as well as the most expensive. Whereas you’d be hard pressed to spend 50 pounds anywhere else (almost), at Alpha, you could drop a 200 and not even blink. However, Alpha is also free from crowds, has wide spacious aisles, and generous selections of everything from tea cookies to different brands of chocolate hazelnut spread. You know you’re part of the upper class when you buy your brown bread at Alpha. Despite the fact I feel slightly guilty at times when going to Alpha simply because I know it is kind of a cop out on the whole “Egyptian” experience, I have to say that I’m not sorry. There are plenty Egyptians who frequent the store seeking the same calm and air conditioning I seek, as well as the freedom from offensive scents, and let’s be real—my monthly stipend of 3200 Egyptian pounds is twice (maybe more) what a taxi driver makes in the same amount of time. I’m not embracing elitism/classism, but I’m not going to deny there are differences in the amount of money people live off of and I’m not going to guilt trip myself into giving up tasting every single kind of tea biscuit there is in Egypt, all available to peruse at leisure in Alpha Market.